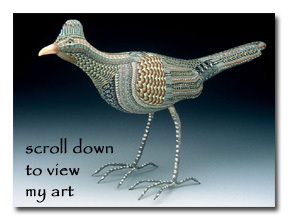 Jon Anderson's Fimo Creations are simply the foremost polymer clay art in the world today. His amazing technique has been honed by over a decade of hard work, creative vision and dedication to the demanding art of polymer clay sculpture. The actual forms or armatures of the animals are created either from recycled hand-molded clay or hand-carved wood. Once the tiles have been pressed onto the armature,(if you look carefully you may see thumbprints), the piece is cured and then fired for a period of hours, further reducing the images and tightening the spaces between the individual tiles. This process may create crazing or tiny fissures in the clay, which adds to the uniqueness of each piece. Finally the eyes are carefully selected and applied to give each creature its own special personality. After cooling, the sculptures are meticulously hand-sanded, making them very smooth and silky to the touch. 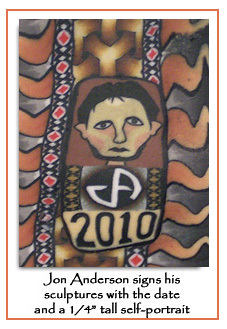 To hold a Jon Anderson Fimo animal is to love it! Because the animals are individually handmade, no two are ever exactly alike. Once the design tiles are all used, that design is gone forever. This renders each piece unique and collectible.